All Things Bike: The BEST bike ever! I chose the Ultegra Di2 road kit with a 50-34 crank and an 11-27 cassette. I decided against Dura Ace because I planned to really test the Boone's limits. I wanted to see how it handled all the rugged Northern Utah terrain at our fingertips -- on road, off-road, gravel, single-track, etc. Anyway, I figured it'd be less painful to scratch up an Ultegra crank as opposed to DA. I ran standard road gearing because it was also going to be my road steed, and I needed to be able to keep up. Ultegra hydraulic disc brakes (before they were a big deal)...never again will I use rim brakes! They offer more stopping power, better modulation, and awesome performance in any weather conditions you dare to ride in. Bontrager RXL FlatTop carbon road bar in a 44cm - two cm wider than I usually ride for off-road stability and a little more flex. The FlatTop feature offered just a bit more width on the top of the bar too. Zipp 303 Firecrest clincher wheelset. I converted them to tubeless...the only way to go! I don't recall ever flatting on that bike. 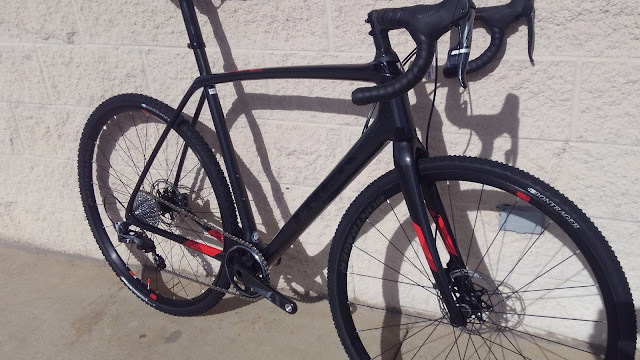 I mounted two Bontrager CX-O 700X33 tires: tubeless ready, light weight, and they roll really great while still offering enough tread for some off-road bite. Today's trend would call for a bigger tire, and I'd jump on that bandwagon for sure, but where I used the bike for full-blown road rides the 33mm width was adequate on dirt while still fast on pavement. Crank Brothers Egg Beater Ti pedals: very light and small. I needed a pedal that was really easy in and out in mud or snow that could hold up to pedal strikes. There were times when some more platform support would've been nice, but all-in-all, I'd use the Egg Beaters again. With a carbon sole and a Shoe Shield installed under the cleat, the platform was solid enough (unless you're a sprinter or a crazy hill-climber in which case you wouldn't be riding this bike). So now you have an idea of my dream bike, here's what I used it for: EVERYTHING! Really. I rode my Boone everywhere you can imagine: Stan's trails, Rattlesnake, Coldwater, Cougar-kill and the entire East Bench including Beus, just about everywhere at SnowBasin including Ice Box and Wheelers, and then thousands of miles on the road. One cool memory comes from a road ride with Matt. He and I planned on meeting at the base of the North Ogden Divide early one morning, ride around Pineview, up Old SnowBasin Road, down Trappers, then out Weber Canyon. I slept through my alarm, so I texted Matt to go on ahead claiming I'd try to catch up. I was about 30 minutes behind when he started up Old SnowBasin Road. I decided to try short-cutting up a dirt trail (Wheelers). I pointed my bike off-road, climbed Wheelers, passed several impressed mountain bikers, and popped out at East Fork just as Matt was passing on the road. Perfect timing! It turned out to be an awesome ride, and I became more enamored with the Boone than ever before. My main use for the Boone was commuting. I live in Plain City and commute to work to South Ogden. My fastest route was 16 miles that cut through the city using the Ogden River Parkway. A funner (but more technical) route led me up above Weber High to a Pleasant View trailhead, along the trail system through North Ogden and the East Bench, and finally down Beus. Definitely a full-body workout! This is where the versatility of the Boone truly blew me away. Wherever I had the notion to ride, I didn't have to hesitate...the Boone would handle whatever I threw at it. Some of my craziest rides were in the Spring when the Ogden and Weber rivers flood over their banks and submerge the Parkway trails. I got soaked and dang near had to swim a time or two, but I always made it across. I learned something awesome about Di2: if you plug all the junction ports, it's 100% waterproof. I tested its waterproof capabilities over and over and it never let me down. Perfect shifting all the time, dry or submerged, with ZERO adjustments! Owning this bike has made me crave adventures on bikes. I loved every minute of our rides together. I've bought and sold countless bikes, but this one actually hurt when I watched her roll out the door with someone else. Hopefully it leads to just as many adventures for him. On the bright side, Trek has rolled out an all-new Boone. It rides smoother with front and rear IsoSpeed; the handling is more predictable with front and rear thru axles; there's more frame clearance for bigger tires; and it's stunningly sleek and beautiful with 100% internal electronic and cable routing. Sign me up! I love the design on the top tube. Trek 2018 Boone 7 in all her glory. Front IsoSpeed creates an incredibly smooth front end by allowing the steerer tube to flex without any lateral movement. This keeps the handling predictable and precise. Front and rear through axles are noticeably stiffer and handle great off-road. Rear IsoSpeed adds vertical compliance to smooth the rough gravel roads. Trek's Control Freak internal cable routing is the cleanest out there. 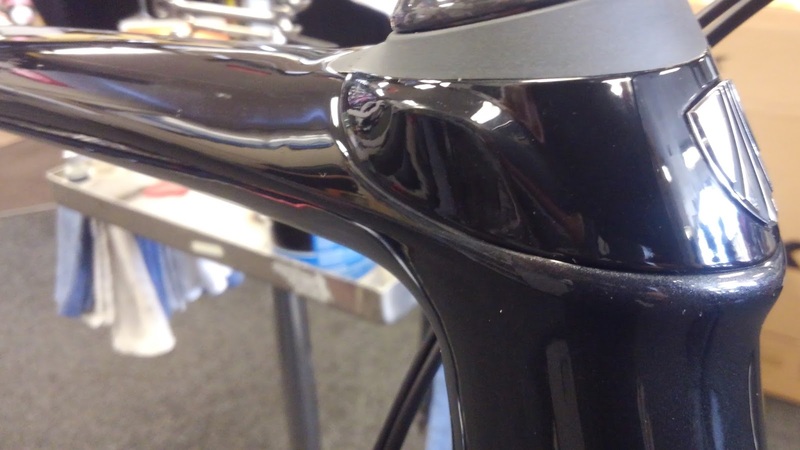 A section of the downtube is removable for clean, easy access to the battery on Di2 systems. From the post it is very clear that you are greatly attached to the bike . You have very well explained about the bike. It would accompanied you in many rides. I hope you will get a new bike very soon. I love your bike! It has some similarities with my Conspiracy Premium Build.